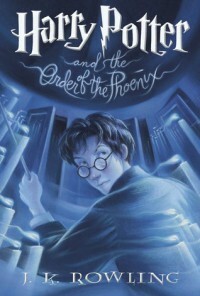 I feel like OOTP gets a lot of flak from the Harry Potter community because Harry is very whiny in it. Now that I'm a little older and wiser I think it's a pretty accurate portrayal of the anxiousness and isolation that teenagers sometimes experience. Removing magic from the picture, not hearing from my friends all summer and living with an abusive family would make me pretty upset too. Then to be publicly ridiculed at school, one of his "safe" places, would be hard for any adult, let alone a teenager to deal with. I'm not saying moments of the story weren't grating, I'm just saying it was a much easier read this time through. I mentioned the narrator's, Jim Dale, female voices were bothering me and I have to say that is still true. He did a great job with what I imagined Umbridge would sound like, but Luna Lovegood was, in my humble opinion, awful. Instead of flighty/whimsical (which is how she was described several different times in this book) the voice was grated and rough. Aside from that I think he's doing a good job with the book as a whole. I still love this book. The Dept of Mysteries, the Order getting together, the DA... all of these are some of my favorite parts of the series. I really enjoyed the end of the book when Dumbledore finally starts filling Harry in on the prophecy and his theories about the connection between him and Voldemort. On a side note, I think the movie version did a great job of the Dumbledore/Voldemort fight in the Ministry of Magic forum. It really brought to life that scene in a way I haven't appreciated before.